The K-Corum display head by Tech Lighting combines intriguing design with high performance. This unique display head is specially designed for a 5.5” Kable Lite separation, making for an even wider spread of light onto surrounding surfaces, and comes with an integrated fully dimmable 3000k LED lamp. The thin metal frame and exposed geometrical heat sink make for a modern industrial look while providing a 360° light output ideal for direct or indirect illumination. The K-Corum display head is ideal for commercial lighting applications such as retail stores, libraries and galleries. 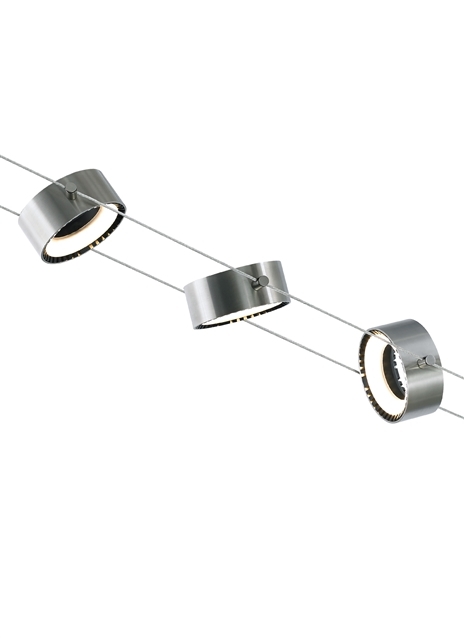 The head rotates 360° making it ideal for direct or indirect illumination. Inspired by the latest in automotive LED headlamp technology, when viewed from behind, the center glows with a hint of illumination. Ships with 5 watt, 265 net lumen, 3000K LED.